Powerful technology. 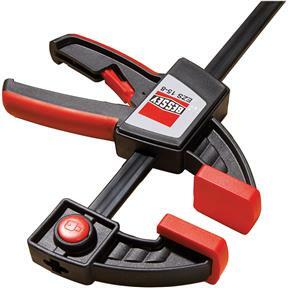 The extremely sophisticated technology makes it possible - single-handed clamping and spreading of work pieces with up to 445 lb clamping force. Intelligent release button. The upper section can be quickly converted from clamping to spreading - without the need for tools or releasing screws. Handle behind the rail. The ergonomically shaped 2-component plastic handle with pump level is positioned behind the rail, enabling a powerful grip. Soft pressure caps guarantee material protection and secure clamping. Internal components that ... Reflect German engineering ... heavy duty for sure!